Stand out on stage in this very elegant and current Gavin. Worn by an Open Champion. Made for All Scotland’s 2013. 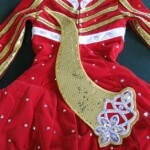 Dress is Red Velvet with Gold sequins and white satin accents. 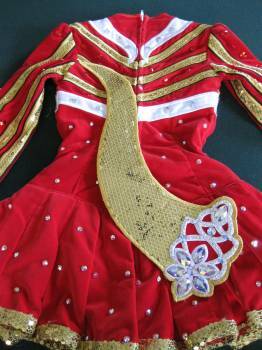 Covered completely with Swarovski crystals applied by Eiore Designs and added to by owner. Includes many large clear pears, clear and red rivoli and 40ss clear and red crystals. Dress was made for a petite teen, apporx. 5 feet tall. Dancer wears a girls US size 10-12 or River Island 9-11. Dress is clean, no odors. Smoke free home, stored away from pets. Dress available to ship on Nov 23, 2013. Shipping costs paid by buyer. Returns to be discussed. Asking Price: $US1750. Shipping costs are not included in the asking price. Returns are negotiable.